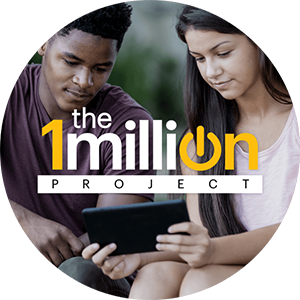 The 1Million Project is the largest corporate initiative to bridge the digital divide and help close the "Homework Gap" for 1 million high school students lacking home internet access. How does the program work? Sprint and the Sprint Foundation have partnered to make free devices and service available to schools and districts to benefit 1 million high school students that currently do not have Internet access or high speed Internet. All high school students will receive the qualification survey in StudentVue. Those students who qualify will be notified by their school and receive a parental consent form. Once form has been returned, the school staff will issue the hot spot device. How does Sprint identify qualified families? The 1Million Project is for high school students who do not have high speed Internet access at home. The guidelines are: students who do not have Internet access in their home, households that have multiple students sharing a single computer, and students who only have access to dial-up Internet at home. What device will be issued? Sprint is providing a mix of mobile hotspots, tablets, and smartphones that can be used as hot spots. A device that allows you to create an Internet connection, similar to a Wi-Fi network. No cables needed and multiple users can share the device's data. What is included in the free monthly service plan? The 1Million Project offers 3GB of complimentary high-speed* LTE service per month, which, based on Sprint's experience and existing research, should enable a student to complete homework assignments. Once the 3GB allotment is consumed, students continue to receive unlimited mobile Internet access at 2G levels. Will the student get to keep the device all throughout high school? This is a multi-year program and students who continue to meet the eligibility requirements will be provided a device for the duration of their time at NNPS. Students will be required to turn their devices in at the end of each school year and they will be reissued at the start of the new school year. Eligibility will be reviewed and a parental consent form will be required at the beginning of each year. What happens if the device is lost or damaged? Circumstances permitting, each student will be allowed one replacement device (damaged only) for the duration of their enrollment in the program. Lost devices will be deactivated and will not be replaced. Are there any associated costs for families to participate in this program? There are no associated costs for families. Sprint provides 3GB of data per month for each family. Can students use the devices to make phone calls, texts, etc.? The primary purpose of these devices is to provide internet access for families. Therefore, there is no voice or data plan activated on these devices. Can the devices be connected to the wireless networks? Is a content filtering service provided with each device? Yes. A Free Children's Internet Protection Act (CIPA) compliant content filter will be provided with every device. This filter blocks adult content and malware while on the Sprint network. Specifically designed for the 1Million Project, this filter is always on and cannot be disabled. The provided content filter is also compatible with any existing content filtering systems the schools may have. View the online flyer for more information. Who do I contact if the device is not working properly? Sprint is providing technical support. They can be reached at 844-309-1680. Newport News Public Schools is proud to be a part of this nationwide project!